By the end of the school day on March 11, 2015, the first day of PARCC testing for Chicago children, media reports and other sources of news are telling a story from across Chicago of teachers and administrators who handled the PARCC Opt Out movement with professionalism and grace. Of the many hundreds of children opting out, few felt any bullying of the kind some worried would happen after the Illinois State Board of Education (ISBE), under the new Governor (Bruce Rauner) and its new President (James Meeks) bullied Chicago Public Schools into a last-minute decision to order the PARCC at all Chicago schools. 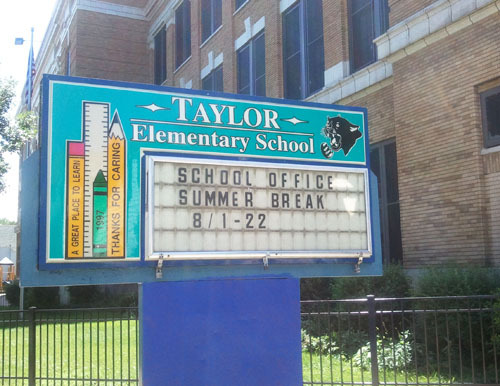 Chicago's Taylor Elementary School is at 99th and S. Avenue H in a part of Chicago that most people don't even know exists. The administration of Taylor has devoted the last couple of years in trying to bring their bullying and otherwise unprofessional behaviors to the world's attention, and with their actions on the first day of PARCC 2015 they may finally have succeeded.It would have been nice had that professionalism been in evidence at all of the city's schools, and for all the children who opted out. Sadly, that is not the case this month. Let me share one dramatic example from where I teach. I am a teacher at Douglas Taylor Elementary School. We are located on Chicago's far Southeast Side, so far that we are in the shadow of the Chicago Skyway and that cars speeding above to the east are in Indiana less than five minutes after they have soared above our school. I am the Chicago Teachers Union delegate for Taylor and have been for years. I am instructed as a condition of my employment (as is everyone) to follow administrative directives or risk being charged with what CPS nowadays calls "insubordination" (just like the military; it wasn't always tht way, by the way). For years now my worrying about when the line is crossed related to trying to be a decent human being while �just following orders� has steadily and greatly increased. This is because of how things have been organized -- working at my particular school, working in CPS, and for public education in general. I bet that many other veteran teachers share this experience. I would like to share the directives I was given and what my students and I experienced for the first day of PARCC testing on March 11, 2015. Directives were fiercely ordered by the Assistant Principal, Urbano Adrianzen, who was accompanied by a woman who did not give her name but said she was �from the Network,� which for our school would be Network 13. I was later told the woman�s name was Mary Rosen, title and credentials unknown. [According to the CPS Position File, Mary Rosen is an hourly worker at the Network 13 office paid $50 per hour, duties not described in the Position File; Assistant Principal Adrianzen is this year being paid $109,000 per year]. Network 13 apparently sent a small monitoring contingent to Taylor School on March 11. One of their targets was my seventh grade classroom. They didn't say. Perhaps this was due to the probable doubling of the number of students opting out this school year in the PARCC (about 55 from what I've been told) compared to the number for last year�s ISAT. [Full disclosure: Like hundreds of others teachers, I passed out a bunch of opt out sheets (�Park the PARCC�) and other information sheets on PARCC out on the sidewalk after work last week and this week. I was doing as have others from CORE (the Caucus of Rank and File Educators of the Chicago Teachers Union) as well as parent groups (including More Than A Score) throughout the city. Like everyone else who was informing parents and children about our rights, I did this on the public sidewalk in front of the school, and on my own time]. I teach seventh grade, and our students were scheduled to take their PARCC on computers. When the students and I entered the designated computer lab, everyone more-or-less found a seat. In our case, two classrooms at one grade level with smaller class sizes to begin with were combined. However, considering that approximately a third had brought in opt out forms (see More Than A Score website) signed by their parents, we teachers anticipated that everyone testing would have a computer with space in between. The proctor in the lab was our lab�s computer teacher. Calling out their names, I placed the students� �tickets� (mini-sheets of paper I was given this morning with their names and their entry information they would need in order to take the test) onto a large central table. Students taking the test came to get their tickets, then sat back down. The apparent "mistake" I made was to allow the students who said, �I�m not taking the test� to line up without physically taking the tickets. That made sense, because otherwise they would have been going to the computers, then returning from the computers -- well, such things happen in real classrooms. So I had those opting out line up to wait for someone to come around to pick them up to take them elsewhere during the test, as per plan. I had been directed to prepare classwork for these students ahead of time; I informed the administration that they could read a favorite book and/or work on other self-selected/directed work, and so the student had these materials with them. Then the melodrama began in a big way. The assistant principal entered, along with the [unidentified] woman from Network 13. To the best of my recollection of sequence, from the shock of it, what follows is the best that I can recall of what happened next. The assistant principal asked if the students in line had been given a ticket. I said that I had put the tickets on the table as I called their names, and they said they were not taking the test. The computer teacher in the lab with me said something similar. The assistant principal said that his question was not answered. Then he got within a few inches of the face of one young man in the line, and asked him loudly, �DID SHE PUT A TICKET IN YOUR HAND?� (Sorry for all caps, but that's how the man was speaking...). I immediately repeated what I said earlier. The assistant principal then ordered me to PUT A TICKET IN EVERY STUDENT'S HAND AND PUT THEM IN FRONT OF A COMPUTER. Everyone was frozen, but did as ordered. I was then ordered to begin to read the testing instructions � with something added like � YOU HAVE THOSE, DON�T YOU? I had the page marked with a sticky note in the large booklet we were given the prior afternoon, when we were called into a fast meeting and informed how to actually give the test (and hope it worked). READ. THE. INSTRUCTIONS. He commanded. Those words were the loud, fierce instructions given to me in front of the students, a teacher who has given standardized tests for over 25 years. I began to read the instructions. During this time I think the students who had sheets signed by their parents for opting out of this test were as stunned as I was; and I think I speak for the computer teacher as well and probably for at least most of the other students in the room as well, that we were all more-or-less shocked or stunned. There was no response from the assistant principal or the woman from the Network. I was met with silence when I walked over and asked as well. The computers began blinking signs of an error, one after the other. The computer teacher had to bounce from one to the other to fix things. I informed the students that we would not begin the test until all the computers were in order. As this additional activity was happening, everyone in the room remained deathly silent. My own hands began to physically shake, thinking about the students who thought they had opted out who were apparently being forced to take this test. (I was internally debating, with the words and actions forming in my mind, of how to opt myself out of the whole thing in front of everyone right there.) The opting out students appeared to be looking at me for some desperate sign of what to do. The assistant principal and Network woman were staring me down, as if daring me to make that famous "one false move." When the computers stopped blinking errors, I began the instructions again, my voice quivering. At two points I stopped the instructions and went up to first the assistant principal and then the woman from the Network and quietly asked them: first, what were we going to do with the students opting out; second, this was what they were doing to students whose parents opted them out (with an emphasis on the word parents)? I was met by both with dead silence and looks that went past me as if I was not there. They had been positioned at both ends of the room, but moved together to powwow at some point. We got to a sickening (physically for me) point in which the next move by the students was to click to start the test. For the students who opted out, I do not know the impacts of their entering information as ordered. Were they somehow counted as taking the test? After I asked around, I was told that no others in the school were made to do this -- to my knowledge, only the students testing with me. Those remaining to take the test had to readjust a bit. I told them that I was sorry for what they had just experienced. The computer teacher and I made sure everyone was alright, took a semi-breath, and they took their first PARCC Test. My grandson did not want to go to school Monday because he was"sick." I had mentioned over the weekend that he may have a test. I asked him if it was because of this test? He said that it was not the test but if he doesn't take it, a teacher had mentioned that the students' grade would go down. I stopped in the office to ask the clerk if I could get him out of the test. The clerk told me that when he is offered the test, he can refuse. When asked,his teacher asked me to check with the counselor to see if he had to take the test. The counselor told me that when they offer him the test,he can refuse. I asked her if his reading or math grades would go down if he refuses? The counselor said "no. "So we will see what happens. Susan, I'm sorry this happened to you and your students. What a nightmare! Thanks Susan Zupan for your description of a real bad day. You maintained your cool while they were forcing the students to take the PARCC and forcing you to be part of the damaging testing plan by CPS and the state. Unfortunately Taylor sounds like JN Thorp. At the end of our first testing day Tuesday, March 10 the 8th grade students were all talking at once how the principal would not �let any one opt out.� Statements were made to the class about the school (JN Thorp) would lose money and teachers would lose their jobs. In this conversation I realized that none of the students were prepared to refuse the test and no one had brought their favorite books to read. I tried suggesting that they should go to the library now, check out the books that you want to read. I also decided on something I could do. On Wednesday morning at 7:45 as students walked into the building, I met many of the 8th graders. I brought a stack of young readers books. I asked if they were going to opt out. Several students repeated they wanted to, but �the teacher said they could not.� I offered these students to choose a book to read. Now, they had something to do. They wrote their name and the book title on a card and I gave them their book. In fifteen minutes a dozen books were gone. I think these students felt like they were going to have a good day. One girl who seemed shy practiced with me. She repeated that she was going to read her book and refuse the test. I was surprised at the end of the day; �Charlie and the Chocolate Factory� was returned to me. The student said she read the whole book. So imagine the good time she had taking a ride in the chocolate book and finished the whole book while her classmates had to suffer hours of testing. I wish some of the writers who have written so eloquently for children had been with David Vance at J.N. Thorp on March 11, or down the street with Susan Zupan at Taylor. All we can all do is thank David, Susan and our other brothers and sisters who are supporting the kids in Opt Out while a small minority of principals, assistant principals, and "Network" assholes keep trying to uphold the craziness and indefensibility of PARCC. Roald Dahl would know what to do with these adults, and the children will cheer as it happens. After some initial resistance from d91 in Lockport my son was able to sit and read quietly in the library adjacent to the computer lab where the test was given. Over all the principal was very accommodating and seemed genuinely concerned for my son. Although she did want my son to go through with the test once I made it clear I want budging she was very cooperative. The easiest way to make sure your local school is more patent friendly is to get involved in the school board and the school board elections. Gather more parents to the cause and have an impact the next election. We can effect change at the local level easier than the state level. im a parent at Henry Clay School. Our Interim Principal told me students could not opt out of test. Clearly, the only way to get the message across will be to keep your child home during the testing, unless you have a child who is fearless and cannot be intimidated. This is the time to teach your kids about their rights. If an adult insists they take the test simply tell them to refuse to touch the keyboard. They cannot force them to do otherwise. It will be a good life lesson for them. I sickened to think administrators would stoop to such levels and lie to students and use such tactics. Deplorable! I'm so glad I retired from CPS 3 years ago and don't have to witness this. I could have never kept my mouth shut. I'm horrified that this took place at ANY school, to ANY teacher, in front of ANY student. I can't imagine the mental state of the students who actually took the test was in any way condusive to academic thinking. I also worry that having the "opt out" students enter in their identification means that these "blank" scores" will count again YOU. You might want to check it out since we are being "evaluated" using these test scores. I am the computer teacher mentioned in the article and I say kudos to Susan Zupan. She bravely stands up for her students, her colleagues and her union brother and sisters despite the fact that she knows there will be retaliation for speaking the truth. No matter what ones feelings about the PARCC may be, there was absolutely no reason students and teachers should have been treated in the way that Susan so accurately described. When I left school that day, I felt that had to be as bad as it could get, and the next day would be better. Sadly not the case, Susan experienced day 2 of verbal abuse and I was removed from the lab (where I work daily) and placed far away from Susan and her students so that I could not act as witness. We teach our students how to recognize and deal with bullying, I guess we are doing a pretty decent job, because the students themselves pointed this classic case of bullying out. I can't understand how the L.S.C. Has kept those clowns there for so long .. That would've never happened back in the day when I was there . It's so sad how Douglas Taylor has gone to pieces ..that school needs some major changes in their administration... L.S.C. Wake up ..do something for the betterment of the school and students .. Taylor School used to be one of the top 50 schools ...!!! Parents band together to do something about the principle and his clown of assistant ... Do it for the betterment of the school ..
Children opting out have the right to be in school! I know there is sometimes a temptation for parents and others to thing, as one person commenting here does, that it's best for the child to keep him home rather than allow him to be subjected to the kind of harassment going on by Principal William Truesdale and the administration at Chicago's Taylor school. But that's not the law, and it's a bad idea. My sone had opted out throughout their elementary school careers at O.A. Thorp, which like Taylor is a Chicago public school. Under two principals and with dozens of different teachers, Sam and Josh have been allowed to read their books while other children had the right to take the tests. That's how professionals should act. Taylor, Clay and other schools where administrators are freaking out about Opt Out are not indicative of most schools we know of in Chicago in 2015. And my hope is that parents will continue expanding Opt Out and demanding that our children have the right to be in school rather than staying at home because someone in power has ordered that this year's test is the one that all the kids should take. Question: Can anyone name all the tests the kids have been forced to take since CPS began mayoral control under Paul Vallas in 1995? Every year, this year's test is THE BEST TEST when in fact next year's test will be different because all of these tests are fraudulent and an attack on children, teachers, and the democracy we cherish. Last year everyone HAD TO TAKE the ISAT. Remember that fraud? And how about the "Preformance Assessments"? And what about the NWEA MAP? And before that the TAP, the ISAT, or maybe the IGAP? Those who are trying to dictate over professional teachers and democracy are constantly defrauding and bullying us with these frauds, while testing companies like Pearson make hundreds of millions of dollars peddling the latest poison in the form of PARCC, ETC. while the Truesdales of the world try to bully decent people into submission. We are winning, and our children continue to have the right to go to school. This year my eighth grade son Sam has been reading "Catch-22," which seems very appropriate. Our fourth grade son Josh already finished "The Last Book in the Universe" -- which seemed more appropriate. Opting Out our children is our right -- and theirs. First, of all- bravo for standing up to this example of tyranny. Secondly, this is a textbook case of a hostile environment and I would consider a reason to fill out one of those test irregularity forms. I can only imagine the discomfort and actual fear the assistant principal and the imperative caused those students who remained to take the test. I felt the heightened anxiety just reading this. I hope the students who experienced this reported it to their parents when they got home. I also hope the local school board acts on the hostile work environment this assistant principal has created. I am so sorry for the teachers and the students who witnessed this kind of behavior by adults who have been charged to first and foremost always provide for the safety of every person in a school. Kudos for Susan Zupan for standing up for her kids! This principal and assistant principal are clearly NOT educators, but are nothing but bullies. They should be fired for this behavior. And kudos to Ms. Zupan for having the courage to report this and to not back down: standing up for one's students is the right thing to do! I wonder if the woman from Network 13 had taken the test security training. If not, she should not have been allowed in the testing room by the asst. principal, according to PARCC's own rules. Could not resist asking! What did they think would happen when they let Rahm handpick the school board? Whoa I just graduated from Taylor and I'm hearing this, is this a bad thing. This should not come as a shock because principals and vice principals have been this way for issues that preceed this PARCC test. They can afford to be because they are paid well, stack the LSC with supporters by helping them get elected, cherry pick issues and bully children. This is not new, it is now expected. I hope these tests are used to break up administrations like these and teachers can teach and children can learn. We ended up leaving and are at k12, in great part, for this exact reason. A highly motivated teacher of an eighth grade with a small class size in a high-scoring school on the northwest side told me about the chaos of working with computers for the 2 hours of the first day of PARCC. She says it was the worst 2 hours of her life and she is now planning to retire earlier than she intended. During the entire 2 hours students' hands stayed up because of computer glitches she told a large group of us. Who devised a test where the student has to keep scrolling up and down, lose his/her screen, then is repeatedly informed that the computer was closed in error, and is doing this with a time limit? And what about the poor teacher running from one student to the hour, putting out fires that keep raging? And why is CPS helping PARCC make money from this educational travesty? I am a proud father of a straight "A" third grade student. I am completely taken back by the actions of the principal and his vice principal. Both of these school officials have repeatedly tried to lie and misrepresent facts to both students and parents. They called parents at home to lie about the facts of not taking the test. Sadly they are able to do this by exploiting the lack of information that some of the children's parents have. After opting out of the test, the principal personally and repetedly harrassed my child, attempting to intimidate her to take the test. Thanks to this newsletter I was informed enough to prepare my kid. I instructed her to deny the exam and to let "them" know they needed to speak to her father about any questions on the opt out form. I asked her before the second day of testing, to let me know if the harrasment continued. It did not. Lets hope that the principal and his vice learn their place and let us decide what is best for our children. Lets hope they can see that wasting time on this unfair waste of time of an exam is an injustice to our kids.